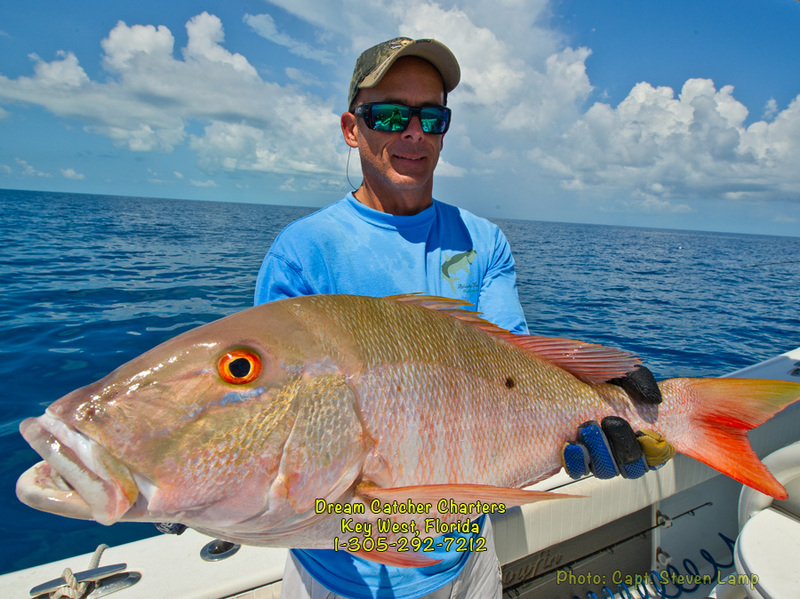 May 28 2013 The mutton snapper (Lutjanus analis) spawn of Key West is a yearly event that is attracting more and more attention by local anglers, commercial fishermen, visiting anglers on charter and the feds. Lets take a look at it. Mutton snapper for me are without a doubt one of the best eating snappers out there and in my top three list of favorite fish to eat, right up there with true American red snapper and yellowtail snapper. Unlike yellowtail but similar to red snapper the mutton is one of the larger snappers. Fish up to 26lbs have been harvested here in Key West pretty regular and Key West also holds the world record for these tasty fish of 30.4 lbs that was caught out near the Dry Tortugas. Personally I really enjoy catching the mutton snappers both for their really good fight and the look of reward on my fishing clients faces when they boat a really nice one. Plus These fish really look great in the box..
Watch My Shallow Water Mutton Snappers Video. Year round mutton snappers of decent size are relatively easy to harvest for a guy with a few gps numbers and some range. The Farther you run West its been my experience the fish get easier, larger and subsequently dumber. Not difficult for me and my anglers on any given day to put 4-8 nice size mutton snapper in the boat along with some black grouper, red grouper and mangrove snappers to make for a good mix. I fish generally in 55 – 85 ft of water so its pretty easy on my anglers. Whats really fun is the fish that I fish for eat jigs pretty well so I don’t usually have to anchor, making it all that much easier. Throughout my days out there I rarely if ever see or come across another boat, making the day in my opinion all the much better. I guess my point here is catching mutton snapper throughout the whole year is really not all that hard. Every year about this time during the May and June (May being best) full moon the mutton snapper spawn off our local reef here just South West of Key West and in a few other locations. Its an amazing event. On these selected humps just on the reef before the deep reef hundreds of thousands of fish come together year after year to the same spot. The females are loaded with roe (eggs) and the males are ready to fertilize this congregation is natures way of insuring the future of the species. While this event happens the muttons are not very weary of capture and a usually selective eater turns into a drunken sailor willing to bite at anything. Therefore making them easy prey to anglers. In this area there are many predators attracted by the copious amounts of egg and sperm in the water as well as the struggle of caught fish. It is often said that the protection of the sharks from harvesting has increased the numbers of them on the reef in the last few years with noticeable numbers of fish being intercepted by sharks more frequently when caught adding to the numbers of mutton snappers taken during this event. Where the mutton snappers gather is not a secret spot by any means but a spot that is easy for anyone to reach in just about any boat with enough anchor line to stay put in roughly 60 – 130 ft of water on several locations up and down the reef line of the Florida Keys and in the Bahamas. With some diligence a little voodoo, the right bait and plenty of cooler space a group of four anglers can limit out a boat with 10 mutton snappers for each angler in less than two hours. In fact, many boats are capable of doing this two to three times in a single night making for quite a haul. It has gotten quite popular. Lets do some math – these fish run in size as I mentioned earlier from 12- 20 lbs. Thats a large quantity of meat and good eating meat as well. 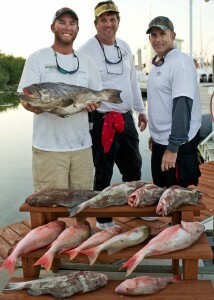 40 Fish X 12 lb average = 480 lbs of uncleaned fish yielding down to roughly 192 lbs of filets. Thats a lot of meat for four anglers, it takes a ton of freezer space to keep that much fish properly frozen and hopefully does not go to waste. Mutton Snapper Caught in 10 ft of water on casting plug. Lets do some more math – Studies show a 20 inch female stands to bear 1.4 million eggs in a single spawn. These eggs will hatch into larva in less than 20 hours. Studies show that there are roughly 2 males to every female caught. So for our bag limit we have about 12 Females on our subject boat of four anglers and a legal limit of 40 mutton snappers. Thats about 5.6 million eggs. So, if we say that 1/2 of 1% of the eggs laid survive to adult fish we are talking 28,000 fish added to the over all population of fish for next year.. Just from one boat.. 28,000 mutton snapper. Thats a lot of snappers.. The argument for regulation is multi sided and heated at times. Here are some schools of thought. I feel as though the legal limit is the legal limit and there is no reason why an angler should not be allowed to exercise his right to bag as many fish as the law allows no matter how easy it is or the impact it may or may not have on the species. Thats why we have laws in place. As much as I would love to see pressure come off of the spawn of these fish I hate regulation. More regulation means more management that frankly is not being overseen by an already under budgeted and under resourced LEO department of FWC. Everyone knows if they have been fishing long enough, when the feds take away, they never give it back even after we have the species crawling out of our ears. Ultimately self regulation would be the ultimate we all know thats not going to happen. As the years go on we have seen the mutton snapper spawn attract more and more anglers to these sights to “get their share”. 10 years ago I really don’t think it was as big an issue as it is today and will be bigger next year and so on. 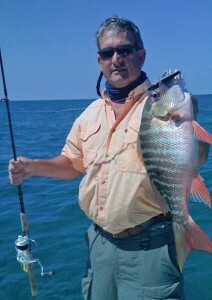 So, Regulation seems to be the road we are on with the mutton snappers here in the Florida Keys. How much, who knows. More and more folks are coming here to get in on the harvest and its becoming a big deal putting this whole thing on the radar for the feds to come in and regulate it. Does it make sense to ease the pressure off the spawn? Sure it does, if the rough math that i did for this article is even close, it means more fish in the population making more opportunities for anglers inshore and offshore to catch these fish outside of the spawn time. But at what cost?